Today was just glorious by my standards. A day like today is why I love thru hiking. There was nothing specific that happened to make it so great. It just was. It was one of the best days I’ve had in awhile actually. The beds in the hotel were super comfy and we all slept great. As usual, I was naturally up at 5:30am to use the bathroom and stayed awake quietly finishing yesterday’s blog post. Not long after, Rockin and Why Not were up. We’re on a relaxed schedule and were able to get a late checkout at noon. The day before yesterday, we realized that our plan of 8.5 days to complete the trail was probably doable, but not as enjoyable as it could be if we felt less rushed. Normally, I think 8.5 days would be plenty, but it’s still early season, there is an unpredictable weather front, and more snow ahead on the trail. We decided to add a day to give us more leeway before the Lost Coast Trail. After that decision, we busted out that 30mi day yesterday, so we didn’t need to leave town until the afternoon. 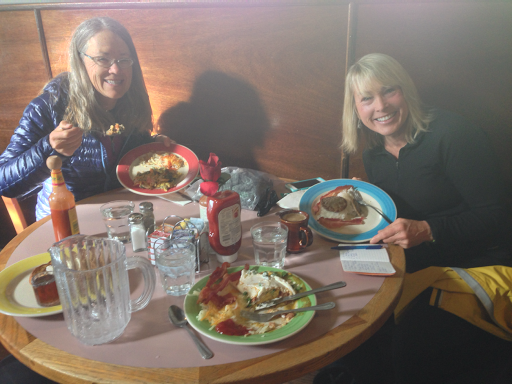 The three of us went back to Rosie’s Cafe at 7:30am for breakfast. I wasn’t even full after my meal last night, so I was really hungry this morning. My hiker hunger is somehow really setting in with this higher elevation and cooler weather. I tend to pay attention to my food spending, but decided to let go and splurge on breakfast today. Even though we had a continental for free at the hotel, I ordered two breakfasts…a Mexican egg burrito and french toast. Oh so great! There was only one waitress for the whole place, so I just snapped a shot at breakfast myself. 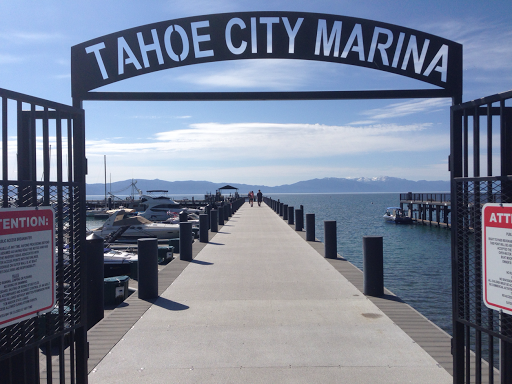 We separated after breakfast to do our town chores and I went out on the Marina behind our hotel, the Tahoe City Inn. It was my favorite moment of the trip so far. Few people were out, the sun was reflecting off the water, and all was calm. I sat on a bench for awhile to take it all in. The view, the moment, all of it. I’m so freakin HAPPY! We have all really enjoyed doing this trail right now. It’s giving us the challenges we enjoy and we feel like we have the trail to ourselves. Today was Saturday and I got to sit on a dock pretty much alone on Lake Tahoe. Pretty dang incredible! After that I went to the grocery store to resupply. I usually send boxes, but this is such a short trip, that it’s easy to do it from the store. All three of us usually don’t like to buy as we go, and it worked out well for all of us this time. It is just a tiring process. 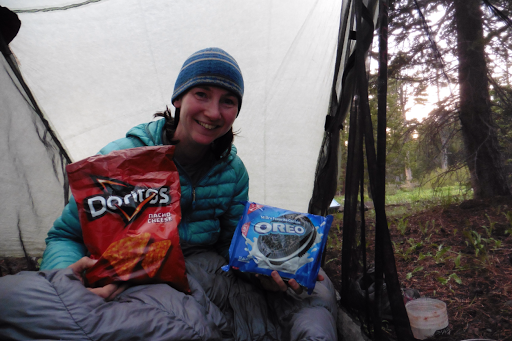 The best part for me is that I’ve been craving Oreos and Doritos on trail, but couldn’t get them on the Hayduke because I had already sent full resupplies to myself. I got a nice big bag of Doritos and a full package of Oreos. Yep, life is pretty dang good. When I got back to the room, I had some time to relax for a bit, but didn’t get to my emails, so I apologize and will get back to people after this trail. We walked down the main street and it was really enjoyable with just the right amount of people to not make it too crowded. 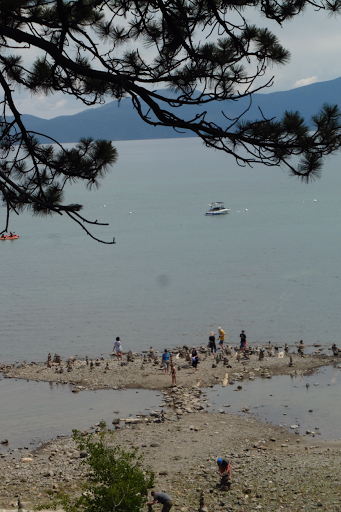 Some families were down by the lake making cairns on a patch that stuck out on the lake and it was an aww moment for all three of us. We got back on trail by 2pm after doing lunch at an organic bagel place and it was pretty warm. There was an 80% chance of showers and thunderstorms again, so we planned to do about 5mi out and just see how we were feeling and how the weather looked. I took a photo of what’s ahead on the trail. We are really looking forward to what’s coming up tomorrow…can you see it?? We are getting on the PCT tomorrow!!! The TRT and PCT overlap for 50 consecutive miles. 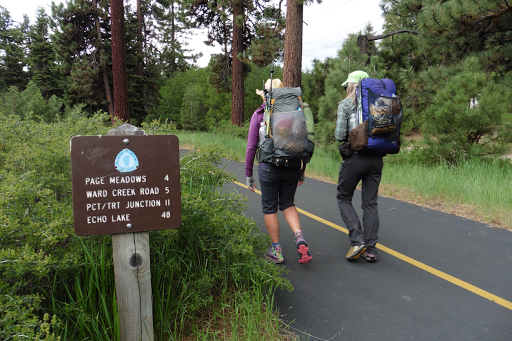 We all have a special place in our hearts for the PCT. I thru hiked in 2011, Why Not thru hiked in 2009 and 2014, and Rockin plans complete her final section (the state of Washington) in July. We are excited to run into some of the thru hikers. 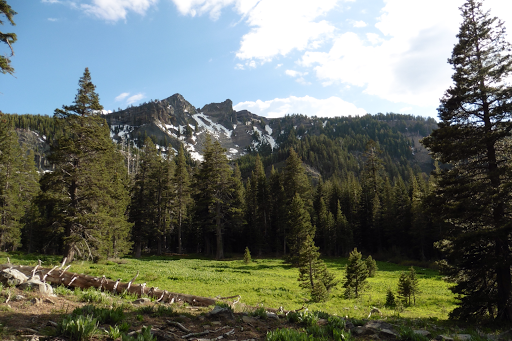 They will be early ones at the front and hikers that have jumped up to let the snow melt in the Sierra. We are intentionally doing this trail counterclockwise (opposite of most) so that we will see the northbounders as we hike south. Sooo excited! The clouds and sun took turns with short spurts of light rain that would last five to ten minutes. With how warm it was, we didn’t use our rain jackets and our umbrellas were perfect. There weren’t many unique sites, but winding through the woods always makes me happy. The Guthook app we are using had some glitches today. Mainly that the databook feature was off and kept reading our location as .2mi ahead of what it really was. The odd thing is that if we looked at the map feature of the app, it would show us right where we were. 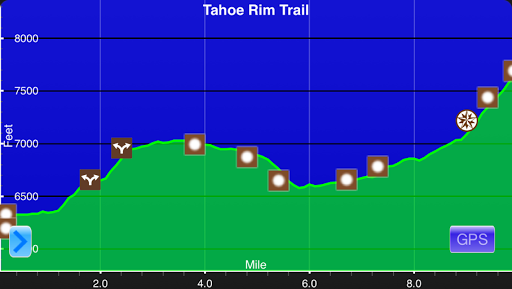 It’s an inexpensive app, that’s fun to have and helps with navigation when there is snow on the trail, but it is not the quality of Guthook’s other apps for the main trails. I’m sure he’ll be improving it, but for now, be sure to pay attention and double check the app’s map with the app’s data book. Plus, that app should never replace a map of the trail. We were hoping to find a campsite with a view and just kept hiking til 6pm with the unexpectedly clear weather. We went much further than planned again and wanted to stop right after a water source at Ward Creek. 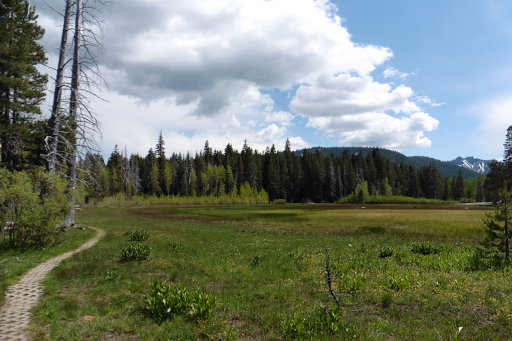 We hit a meadow with a great backdrop of Twin Peaks (we will hike toward that summit tomorrow)and walked around looking for flat spots that weren’t lumpy or marshy. Just as we were trying to decide, the thunder rolled as dark clouds moved in. 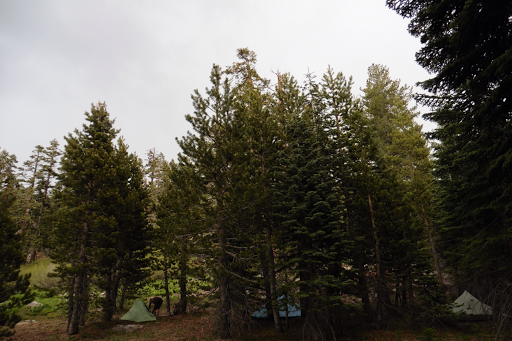 We quickly committed to camping in a sheltered, but slightly slanted, and got the tents up just before the brief storm hit. I timed it, and it lasted for 18mins, but felt much longer with how heavy the rainfall was. The thunder cracked loudly a couple of times and we all were happy and dry in our tents. What perfect timing! I’ve always enjoyed the entertainment of a thunderstorm from a well pitched and protected tent. I didn’t even have to shut one of my storm doors for most of it, and I got to watch the rain pour down. Love it! When it stopped, I made Ramen (first time this season) which I’ve been craving, along with some carrots Rockin gave me, Doritos, and Oreos. Yep, doesn’t get much better in my book! The next wave of thunderstorms hit before 9pm and lasted 30mins or so. Again, there’s nothing like being nestled in a warm and dry sleeping bag while rain falls on the tent. Yep, I’m a happy camper! 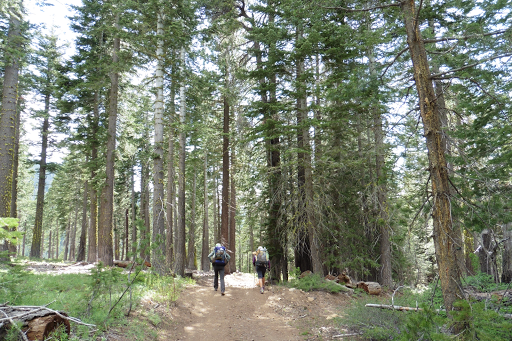 Tomorrow morning, we are getting on the PCT…EEEK! Oh! I’m headed into a remote area and may not have service to post the next couple of days.